Breakfast options just got a little tastier! These oil-free, vegan waffles are easy to make and absolutely delicious. They have been taste-tested on a large crowd ranging from 3- 86 years old— and let me tell you, they were a crowd pleaser. The best part of all, the waffles are healthy too! You read that right, healthy, crowd pleasing, recipe. 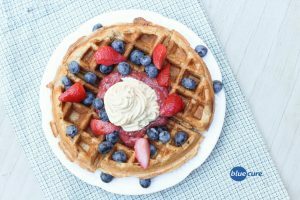 Whole wheat flour, applesauce, and plant-based milk are the main ingredients in these waffles. Swap in chickpea flour for the whole wheat flour for a higher protein, gluten-free alternative. Top the waffles off with cashew cream, berry chia jelly, and fresh fruit for more healthful, tasty flavors. For those of you without waffle makers, I am sure this would make a wonderful pancake recipe too! Pictured above: whole grain waffles with strawberry chia jelly, and cashew cream. Plug in the waffle maker and turn to medium-high heat. If using chickpea flour, you will want to use a lower setting. In a small bowl, mix together the dry ingredients: flour, baking powder, and cinnamon. In a separate bowl, combine the applesauce, plant-based milk, and vanilla. Pour the wet mixture into the dry mixture and stir until well-combined. Follow the instructions of your waffle maker (mine has a light and beeper for when it is ready); you may also need to lightly oil your waffle iron. When the waffle maker is ready, pour 1/3-1/2 the batter into the middle of the iron and work it towards the edges. Cook until desired texture and repeat until the batter is gone. Note: To get the cashew cream to look like whipped cream: soak the cashews in water for several hours. Drain off the water and then pour into a blender. Use 2 Tbsp- 1/4 cup water for every 1 cup of cashews. Blend until smooth. You will need cake decorating tips and a tube. Scoop the frosting into the tube, and then top onto your waffles.